Pond heaters and de-icers are a popular method of providing temperature control to your pond waters during colder winter months. 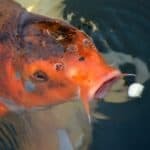 In this article we’ll provide comparisons between different types of de-icers, as well as recommend our best pond heater picks for koi and fish ponds. Should I use a Pond Heater in Winter? Koi hibernate during winter but still need oxygen to survive, and they will struggle to get this if the pond is frozen over. Pond heaters come in a variety of forms, but all are designed to provide three main functions – to increase oxygen content, to allow gas exchange, and to make pond fish more comfortable during hibernation. Oxygen levels can become drastically reduced in winter, and without a suitable surface opening for gas exchange, fish will begin to suffer in the low-oxygen conditions. A de-icer heater will be able to create a constant surface opening for oxygenation, whereas an inline pond heater or immersed heater will raise the temperature of the surrounding water. If you don’t have any pond fish, or if your pond doesn’t fully freeze over during winter, you may not need to invest in a pond heater. During winter fish will remain in a state of topor (commonly referred to within the hobby as “hibernation”) at the deepest point of your pond, as this is the warmest, and as long as they can still get oxygen, they should be perfectly happy! If, however, your pond water becomes completely frozen and you have fish, it may be beneficial to add a heater to be safe. Koi in-particular are very sensitive to dissolved oxygen levels, with most Koi owners choosing to run a de-icer during the winter to ensure their fish have the best possible environment to hibernate. Adding a heater or de-icer forms just one step of safely “winterizing” a fish pond, so for more information on the other steps be sure to check our main guide on winter care here. When is a heater not suitable? If you have a very small pond (<100 gallons~), using a heater over the winter is not advisable. Even a smaller floating heater may be too much, and can literally cook your fish! For really small ponds, especially pre-formed ponds with goldfish, it’s better just to bring them indoors over winter. It’ll save you money, and you won’t be placing your fish at risk. If the heater has overheating protection installed (such as with immersed heaters), these can often be used in smaller environments but we still recommend testing the overheating function first within a bath or small bowl of water to ensure it’s functioning properly before adding to the pond. Simply submerse the heater in water, set the desired temperature, and wait for the heater to switch off when the designated temperature is achieved. In-line heaters raise water temperature as it passes through a central heating chamber. An inline electric water heater is a component you add to your ponds plumbing circuit which gradually heats the entire pond as water passes through it. The heater is usually connected to external pump which passes water into the heating chamber from the pond. Unlike a floating heater which is designed to keep a section of surface water open for gas exchange, an inline heaters purpose is full water temperature control, increasing the temperature of the whole pond by a few degrees when operational. They’re expensive to run, however, and require much more work to install correctly due to the added pipework. If you get particularly cold winters, it’s doubtful the slight increase in temperature will be able to keep your pond ice-free unless you’re running a high kilowatt model. For optimal performance, we recommend 1kW of power for every 1,000 US gallons (4500 litres) of pond water, so ideally for a 3,000 gallon Koi pond you’d want a 3,000kW in-line heater for maintaining water temperatures and keeping away top ice. Immersed and in-line heaters are able to raise the surrounding water temperature directly. Alternatively, for a most cost-effective and easy to install solution, you can opt for an immersed heater element (pictured) designed for use in large-scale aquarium tanks. These are essentially the same as the small aquarium heaters you’ve probably seen in hobbyist stores, but with much better heating potential! If placed strategically, you can easily create a “warm pocket” within your pond for your fish to hide during the winter, either using a single heater or a few heaters, depending on your pond size. For best operation, we recommend placing these types of heaters in areas of low water flow and as deep in the pond as possible. This will ensure that the least amount of heat is lost to the surface (more aeration = more heat loss), and the heater doesn’t become exposed to the atmosphere. Floating de-icers are a cheap and easy solution for keeping a breathing hole open in pond ice. A more common type of pond heater is a floating de-icer which sits on the top of your surface water. This device is not designed to heat the overall temperature of your water, but instead it creates a constant ice-free surface opening for gas exchange to take place. The primary reason to purchase a pond heater is to make sure your fish have enough oxygen to remain healthy and survive the winter. Stopping your pond water freezing solid and keeping an opening for oxygen to penetrate your surface water is the best way to achieve this, and a de-icer is perfect for this job! These heaters are usually very cheap to run, and don’t require much in the way of setup. They would be an ideal winter addition for small ponds, large ponds, and even heavy stocked Koi ponds. They can also be combined with an in-line heater for maximum temperature control, although this type of arrangement is likely overkill for most regular fish keepers and pond owners. What pond heater do we recommend? An air pump will work alongside your heater to oxygenate pond water over winter, which also helps keep ice away. Unless you’re a fish breeder or keep a heavy amount of koi, we would usually recommend a high quality floating de-icer for most ponds. These heaters are easier to install, cheaper to run, and will be able to provide enough oxygenation for even large Koi ponds. In-line pond heaters certainly have a purpose, but for a general garden pond owner who just wants to make sure their fish are safe, a floating de-icer is just a more cost-effective option. Fish can naturally survive extremely cold temperatures as they sleep, so the addition of oxygen from a surface opeioning is all you really need to keep your fish safe and happy. If you still want more pond heating and are interested in electric heaters, always make sure the unit has a digital thermostat for monitoring and adjusting water temperatures. Leaving an electric heater on can be even more dangerous to your fish than the cold if temperatures get too high, so selecting the right kW rating and regularly monitoring water temps is essential. As well as this, if you have a lot of fish in your pond, you can combine a pond heater with an oxygenating air pump for maximum benefits over winter. The air pump will not only provide a direct supply of oxygen, but it can also help break up ice from forming alongside your heater – win win! Frozen Ponds – What should you do? If your pond completely freezes over, gas exchange can no longer take place across your surface water. Oxygen which is exchanged from the air won’t be able to penetrate your pond and levels will slowly decrease. A pond de-icer will be able to create a hole in your pond ice allowing oxygenation to take place, even during the coldest months. Without a sufficient level of dissolved oxygen in your pond, your fish can quickly become sick and die. As well as this, carbon dioxide (Co2) can slowly build up under the surface as Oxygen (O2) levels fall, as it can’t escape naturally. Having a region of pond water free of ice will allow oxygen to penetrate your waters and also allow harmful gas buildup to escape. As your pond heater or de-icer starts to work, an area of water will become free of ice and the temperature will increase. This will cause an increase in water flow throughout your pond, even under the remaining ice. As warmer water (more energetic molecules) around your de-icer move to colder water (less energetic modules), this creates a flow which helps with oxygenation. In the absence of a pump or waterfall, the additional flow created with a heater is beneficial to a ponds eco-system. Although not as important as the other benefits, having a constantly ice-free region of pond water will allow for much faster thawing when warmer temperatures arrive. You should not have to manually break up the surface ice, as your heater would have done much of the work for you. The heater will slowly work alongside the rising temperatures and gradually melt a larger, and larger area of pond ice. Due to the different brands available between the US and UK markets, we’ve researched and divided our categories to provide both American and UK pond owners a review on the best pond de-icers available. We have listed below our best pond heater picks available to both the US and UK market. Try adding an aerator to your pond over winter! Combing an air pump with your heater will allow for the best oxygenation to take place, and will also help with ice-break up and water flow. Our first de-icer entry is the TetraPond floating de-icer with natural rock camouflage design. This is a fairly straightforward pond heater, operating up to 300w and functional at temperatures as low as – 20°F. The heat output from this heater is decent, and should be able to keep a constant breathing hole open all winter for your fish. The hole that is formed in the ice is a good size, but we found the heat spread wasn’t particularly amazing, so the hole may not be big enough for larger koi ponds (more suitable for goldfish). TetraPonds heater is easy to install, and comes with a generous 15 foot power cable so you should have no problem powering it up. The heater features a unique natural rock-style design, which helps the heater blend in more with your pond surroundings. This, combined with its fairly compact size, means this is a very discreet floating heater choice. The heater also has an automatic thermostat system in-place which monitors water temperature and will automatically switch off the heater when not required. This heater comes with a lengthy 3 year warranty, and has proven to be reliable over multiple winters. It’s better to install the heater before your pond freezes, but it can also be placed on top of a frozen pond and it will slowly melt the ice and sink. The only issue we found with this model is the underneath has a tendency to collect debris due to its basket shape. So long as you give it a good clean between seasons to stop mold/rust building up, this shouldn’t be an issue. Overall, a discreet and reliable floating heater choice for small ponds and ponds with fish. If you’re looking for a cost-effective heater while still maintaining strong output, you really can’t go wrong with this model. One of our favorite pond de-icers, and our preferred choice for ponds with Koi. The Laguna PowerHeat floating heater provides a strong 315w output and good heat spread for a fairly large ice opening. The heater also comes with an additional 15w rated top heater which prevents snow and ice buildup on the top of the unit. This is particularly useful for areas which get a lot of snowfall, as the added weight can cause issues with a heater overtime. The heater can operate at temperatures as low as -20°F, and with the added benefit of the top heater, should be able to withstand even the heaviest of winters. On the top of the heater is a convenient low-energy LED light, which basically lets you know the heater is still working. This is a useful feature when there is heavy snowfall as sometimes it’s hard to tell when things become covered. The 315w main heater provides a strong output and a really good heat spread. The hole the heater forms in the surface ice is a good size, and would suit ponds with larger fish, such as Koi. The heater is strong enough to slightly heat the surrounding water so your fish will likely swim close in the coldest months for added comfort. To prevent overheating, the Laguna de-icer has an automatic protection system that monitors the devices temperature. It will switch off automatically when the water reaches a certain temperature, or if the device becomes too hot. Included is a very long 22 foot power cable which will suit ponds further away from a mains socket. We recommend placing the heater as close to the ponds center as possible, but close enough to the edges that you can reach it for maintenance. Overall, a great floating pond heater which provides a strong output and good heat spread. We recommend this heater for larger ponds, or koi ponds, as the hole is slightly larger than other de-icer models. The only negative is the short 1 year limited warranty, but since the heater is quite reliable when taken care of, we can’t see this being a major concern. If you’re looking for more than just a hole in the ice over winter, the next step would be an electrical heater capable of actually raising the surrounding water temperature. Although not as powerful as some in-line water heaters, these 1,000 watt rated immersed heaters from Catalina are an interesting (and cheap!) option for creating “warm pockets” with your pond for your fish to comfortably hibernate, without breaking the bank. Although the Catalina RF-1000 is designed for large-scale aquarium use, it can easily be incorporated within a pond environment with similar results. The top model (pictured) is rated at 1kw, or 1000 watts, and is capable of effectively warming a 400 gallon pond or aquarium. Although these types of immersed heaters are unlikely capable of heating larger ponds, they’re great for creating a section of warmer water within a pond for fish to retreat to when weather gets chilly. Since they’re fairly cheap and easy to install compared to in-line models, you can strategically place one or more heaters in sections of lower water flow (higher flow = more heat loss), which would effectively create a warm pocket of water within your fish pond, as well as keep ice away in this location. For best results, we’d recommend 1 heater for every 300-400 gallons of pond water, as you’d only need them to heat a small section of water in ponds, rather than the whole system as intended in aquariums (although if your pond is <400~ gallons, it should raise overall temps by a few degrees!). To protect fish and wildlife from the direct heat, the heaters are fitted with a durable plastic guard which covers the main heating element. The 14″ heating chamber itself is made from corrosion resistant titanium alloy, and is designed to withstand long-term deterioration from water quality and pH fluctuations. Included also is an integrated temperature control panel and thermostat, allowing heating within the range of 72 to 93 degrees F.
To prevent damage from overheating, the temperature controller has an automatic shut-off function when the desired temperatures are reached. The same function will also kick-in if the heater is exposed to the air, meaning if the heater begins to float the mains power will be switched off to prevent damage from exposure. Overall, an interesting alternative heating option to floating de-icers that could help create warm sections of pond water for fish to comfortably hibernate. If you live in a particularly cold climate, combining the heater with a floating de-icer to ensure no surface ice can form should be a very effective winter combination. Hozelocks energy efficient floating heater is a great solution for small ponds or preformed ponds during winter to stop them freezing over. The heater runs at a respectable 100w, and has quite a decent spread of heat, slightly warming the water around it. The heater is very easy to install, but fairly basic in operation. It doesn’t have a built-in thermostat, and no fancy features for temperature control. It has a on/off switch and needs to be manually powered down after use. An integrated thermostat is something we generally like to see in heaters, but since the price is so low and its output isn’t huge, it’s not a major problem. Included is a fairly long 5 metre power cord which needs to be plugged into your mains. The heater is most effective when placed before ice has formed, but it can also be placed on top of a frozen pond and it will slowly sink and melt the surrounding ice. It cannot be submerged, however, and needs to float on your surface water to be effective. Due to the fact this heater runs at half the power of most other units, it would be a much more cost-effective option for smaller ponds with goldfish. If your pond is slightly too large to bring indoors, this is the next best option! It would also be fine for larger ponds, but if you have a lot of fish, you may benefit more from a heater which creates a larger breathing hole. A slightly different style of pond heater is the Oase Pond Ice-Free Thermo range of heaters. These de-icers come in two models, a 330w model and 200w model, and feature an interesting rod style heating system. Unlike conventional floating heaters which warm the water using a metal sheet at the base of the unit, the Oase Ice-Free Thermo is able to heat much deeper with its longer rod design. This different method of heating provides a larger area of warmth for fish, as well as allowing for more water flow to take place under the ice. As warmer water rises, small currents are produced that help spread the heat and oxygen. The Oase Ice-Free Thermo provides very good water heating, and also provides a strong heat spread for a fairly large ice opening. Since the heater using a rod system to slowly melt ice, it needs to be placed in water and cannot function on an already frozen pond. If your pond is frozen, you will need to carefully remove enough ice for the unit to sit on the surface of the water. The units come with a long 10 metre power cable, and is very easy to assemble. The heating rod fits through the top of the base unit, and the base unit is placed on your water surface. The 330w model also comes with an integrated frost monitor system, which provides automatic power on/off function. This saves power by switching off during warmer temperatures and only turning on when there is a danger of frost. A downside is that there is no simple LED light to indicate the unit is actually on, which was quite disappointing and slightly inconvenient. This heater series would be a fantastic choice for larger ponds, especially those with Koi, but can also work well with shallower ponds. The generous heat spread will provide your fish more comfort, and provide more water flow under the surface during colder months. A great pond deicer choice! A powerful electric in-line pond heater from Blue Lagoon, providing effective heating for ponds between 4,500 litres and 10,000 litres, depending on depth and climate. These heaters work similarly to regular pool heaters, using a single-phase heating chamber to increase the temperature of water that passes through it, and then returning the warmer water back to the main system. Blue Lagoon’s heaters are all designed to be placed in-line with your pump equipment, which means they’ll need to be plumbed into your pipework manually after your external or submersible pump. The heater can be installed in a separate circuit for easier maintenance, or directly in-line with your pond filter which would be where the heated water would exit the system. In most cases we would recommend a separate install to improve water flow and the use of a self-priming external pump with leaf basket to prevent debris clogging the heater. A pump with a minimum rating of 2,000-4,000 LPH is recommended for good water flow and heating efficiency if installed in its own separate plumbing circuit. The heater comes in a single model rated at 3000 watts, and includes an integrated thermostat for temperature control. The control options are more basic compared to more expensive spa/pool heaters, but they still provide enough functionality and control for safe heating in koi and goldfish ponds over winter. Included is a multi-threaded adaptor on both the inlet and outlet heads, providing connection options for common 1-1.5″ ID tubing and hosing. The heater is contained in a weather resistant steel casing, although we would still recommend a sturdy water-tight cover to prevent gradual wear and tear with outdoor usage. Overall, a powerful and reliable range of in-line electric heating solutions for both small and large koi ponds. They may be a little expensive to run compared to a regular de-icer, but if you want full water heating for your fish, these are some of the easiest and most efficiency in-line heaters around. I have 300-350 gallon pond with koi. Will the Catalina RG-1000 IMMERSIBLE HEATER work or be took much? I also have a floating de-icer and aerator pump/filter. The heater should be fine for that pond size. In-fact, adding these types of heaters to smaller ponds (<400~ gallons) is much more effective than larger ponds as you will be able to heat much more of the surrounding water, not just a small section. They also have built-in overheating protection as standard, so they'll just switch off if temps get too high (very unlikely in an outdoor pond! ).